Miu Miu taps a fresh cast for its resort 2017 campaign. Inspired by an all-night stroll through the streets of Rome, models Dree Hemingway, Cecilia Chancellor, Brigit Kos,Faretta Radic and Sara Somogyi appear in the advertisements. Photographed byAlasdair McLellan on the famous road Via Appia Antica, the girls wear embellished styles with a youthful twist. From bags with sparkling crystals to silk jackets and knit sweaters, the designs stand out in the eclectic images. Miu Miu. Mention the brand and an image of a young girly-girl comes to mind, Prada’s younger sister who’s not afraid to embrace bold patterns and even brighter colours. She’s quirky, she’s intellectual, she’s fun, and I would like to think, one who is aware of current trends and takes what she deems best to suit her personality and make it her own. Sometimes she’s all about florals and plaids, other times (like this season), she is intent to take something vintage-y from Grandma’s wardrobe and give it a new twist. Which brings us to today’s #bagoftheday, an embellished floral-jacquard tote that comes trimmed with patent leather on the sides. Measuring some 27.5 cm by 18.5 cm, the framed satchel is, at first glance, a lot to take in. From its rich floral-jacquard fabric to its oversized glided buckle that comes encrusted with all manner of crystals in clear, red and green, this is definitely something Miu Miu (the girl) will love, a bag for everyday that she can easily dress up or down with. Made available with an additional shoulder sling which you can then use to tote this bag over the shoulder, she’s definitely not for the faint-hearted, something the Miu Miu girl is most definitely not. Priced at USD2808 and now available via NET-A-PORTER, this is one of those statement bags from F/W16 that no fashion-forward lady should be without. 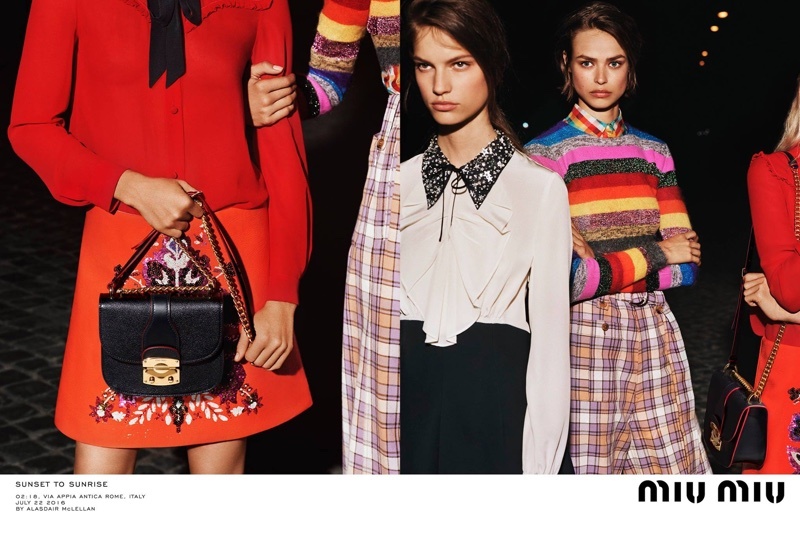 Established in 1993 as the sister line of the Italian fashion label Prada, Miu Miu's edgy and provocative take on current styles have made the brand a powerful force in its own right. Feminine and sophisticated, yet playful with a rebellious attitude, Miu Miu's collections continue to subvert expectations and experiments with contemporary fashions to create distinctive avant-garde pieces. A Miu Miu shoulder bag epitomizes this clash of influences and innovative designs. Pops of brights, metallic detailing and striking embellishments are symptomatic of the distinctive line. The perfect investment piece. Miu Miu bags blend contemporary, ornate and eclectic details with luxe materials and high quality to create a covetable range. Using a rich color palette and whimsy flair, Miu Miu's bags mix sleek elegance and tomboy charm to create bold leather totes, fringed shoulder bags and contrast-paneled satchels. 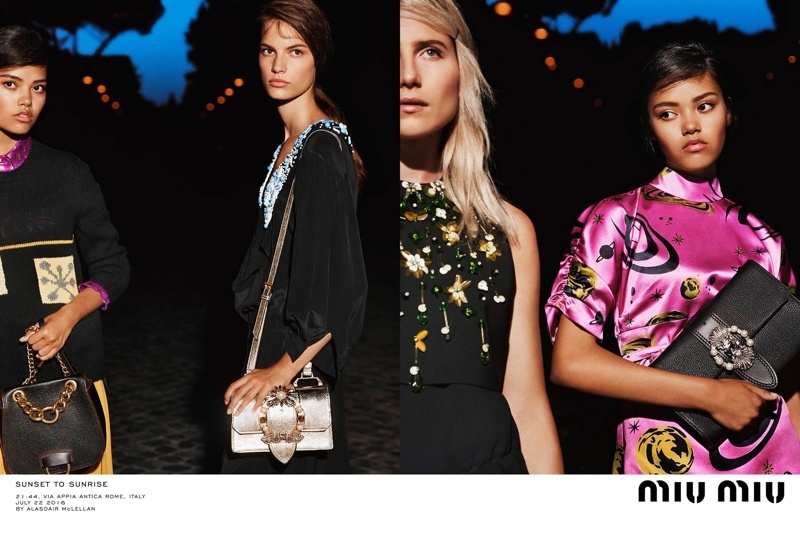 For evening occasions, Miu Miu offers an embellished and pared-back range of must-have bags and clutches. Crafted from floral jacquard with black leather trims and sparkling embellishments, Miu Miu seamlessly bridges the gap between the Old West and vintage glamour. An extravagant crystal-embellished buckle sits proudly at the front as a bold accent to the structured shape of this tote. Note the grosgrain ribbon-wrapped top handle and patent leather sides which give a ladylike finish. A new bag from Miu Miu that we love, we handpicked this bag because of its sophisticated beauty. Aside from its attractive details, maybe it’s the perfect mixture of crystal and floral that caught our attention that’s why we are featuring this bag. Ladies, make way for Miu Miu’s Crystal Floral Jacquard Tote. An absolute eye candy, this one is a definite must-have for women who love to play with fashion. Beautifully crafted from floral jacquard with black leather trims and sparkling embellishments, Miu Miu effortlessly and seamlessly brings the fusion of the Old West and vintage glamour. Now if that’s not yet enough for picky ladies, what about the fact that it has an extravagant and fancy crystal-embellished buckle that sits proudly at the front as an eye catching accent to the structured shape of this tote? Also, take note of the grosgrain ribbon-wrapped top handle and patent leather sides, which lends it a ladylike finish. Made from fabric with calf-leather trim, this beauty of a bag features an adjustable shoulder strap, three internal compartments, internal zipped and slot pockets. So plenty of room. Measures 7.5’ x 11’ x 6’ (H x W x D) inches and is priced $2710 USD, €2200 euro, $21000 HKD, $4010 AUD, £331000 JPY via MyTheresa.